It's a saucy week here on IMPROV kitchen. The other day I shared my absolute favorite bourbon vanilla bean salted caramel. It's a mouthful to say but man is it a killer sauce! This sauce is it's milder counterpart. 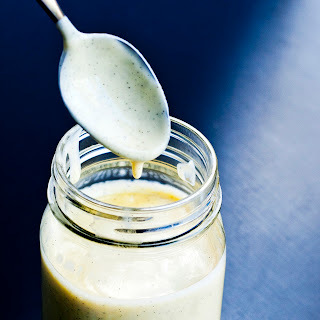 It's a bourbon vanilla bean creme anglaise (vanilla sauce). On the creamy vs. non creamy team, I'm a die hard fan of creamy. 100% of the time I will pick a cream sauce, creamy dessert, creamy ANYTHING over another option. Since Matt loves bourbon, I try to incorporate it in places where it's not overpowering. I'm not the biggest fan of any type of whiskey but this sauce is a perfect balance of creamy, rich vanilla with a subtle kick of sharp bourbon. It's great used on lots of desserts which is why I decided to give it it's own post. I've put it on pecan pie, bread pudding, chocolate soufflés and in moments of weakness I've eaten it by the spoonful. This is a judge free zone! In a medium saucepan, bring cream, milk and vanilla bean to a gentle simmer, stirring frequently. Cook for 5 - 6 minutes and then pull off the heat and set aside. In a medium bowl, whisk egg yolks with sugar until they turn slightly pale yellow and the sugar starts to dissolve. Discard the vanilla pod and slowly add in a splash of the cream mixture into the yolks, stirring constantly. Slowly add more and more of the cream mixture into the egg mixture. You want to gradually increase the temperature of the eggs so that they cook without scrambling. Return the cream/egg mixture to the saucepan and cook over low heat until the sauce thickens enough to coat the back of a wooden spoon. You'll know it's done when you slide your finger down the back of the spoon and the line holds. Pour in the bourbon and remove the mixture from the heat and pour through a fine mesh sieve. This will make sure if you didn't properly temper the eggs that you keep any scrambled bits out. Pour into a container and place in the refrigerator for at least 2 hours. The sauce can be made 2 - 3 days in advance. When you're ready to serve it, you can heat it up on the stove or in a microwave. It's good cold too. Depending on the type of dessert you're making. you can use whatever type of milk you have on hand. if the sauce is too thick for your taste, you can thin it out with a bit more cream. not a fan of bourbon? substitute for your favorite liquor. You can leave the booze out too. If you don't have vanilla beans, you can substitute for vanilla extract. you can easily switch up the flavor profile by adding in almond, raspberry, or even lemon extract. Looks really delish! And simple too. The ingredients and method remind me of crème brûlée which I absolutely love and adore so will have to give this one a go! You're dead on! It's like liquid creme brule without the awesome burn sugar crunch... hmmmm, bourbon creme brule might be a fun thing to try next! Thanks for the comment. Hello, I love vanilla and this sauce seems delicious. You say that it can be made 3 days in advance, but how long do you think it can stay in the fridge to be used? It's certainly a fantastic type of sauce to have near by. This is a wonderful sauce and I agree with Ana, this sauce can't stay in the fridge atleast in my home. This looks sinful! Hi there! This looks awesome! Is it stable enough to be used as a filling for a cupcake? No, it's a pretty thin consistency. If you're looking for a true filling, I would try something else. It could be interesting though if the sauce soaked into the center of the cupcake... It would make a moist cake - kind of like tres leches but bourbon vanilla bean. If you're not up for an experiment, I would probably look for a different filling for your cupcakes. You can always adapt a custard by adding in a splash of bourbon!